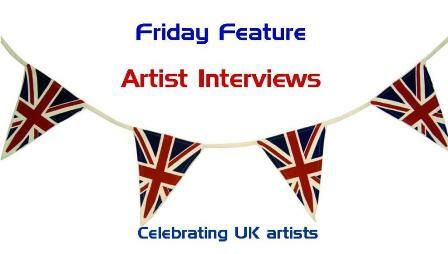 Welcome to the fifth interview celebrating the talents of British artists in the field of scrapbooking, photography, mixed-media, art journaling, feltmaking and quilting. Some names you may know and some may not be so familiar but they are all hugely talented. I am a certified Ranger Educator and teach mixed media art workshops. I also create articles for Craft Stamper Magazine and produce artwork that I sell in my Folksy Shop. I have a husband, three beautiful children, a Japanese Shiba Inu (dog), two Chinchillas and a hamster. My Dad is my first one, he is what I would class as a true artist, can turn his hand to anything and is quite simply brilliant :o) His sketches, drawings and paintings are excellent. Tim Holtz inspired me to become more creative just after I had discovered scrapbooking and I've gone on from that really. And my Daughter Saskia, she is a very intuitive artist, she has real skill and talent (from my dad obviously !) I enjoy watching her come up with new and exciting ideas. Oh gosh !, not sure I could limit it to just one ! hmmm, I suppose all things inky would cover it ! I remember making a brown sugar paper rabbit at Primary school, it was for Easter for my mum, We stuffed them with cotton wool and stitched the edges. I believe my mum still has it. Lol, I think I'm still finding that ! I would hate to think there is only one, perhaps like fashion I prefer to be a bit of a chameleon, never quite what people expect ! I don't think I have one of my own, I know that when I demo at the shows people like to see the alcohol ink resist on a glass slide technique ... that always goes down well ! If you were able to ask Anneliese anything what would you ask? Please add your question to the comments below. See you next Friday for an interview with Linda & Laura Kemshall. Plus there'll be a (special occasion) giveaway. Really interesting to read - I'm wondering what the most unusual item Anneliese has ever incorporated into her work... I see she uses lots of different things. What a wonderful post this is Bernice! Have a fabulous week and I look forward to getting to know you!